Identify and explain the properties of a projectile, such as acceleration due to gravity, range, maximum height, and trajectory. Determine the location and velocity of a projectile at different points in its trajectory. Apply the principle of independence of motion to solve projectile motion problems. Projectile motion is the motion of an object thrown or projected into the air, subject to only the acceleration of gravity. The object is called a projectile, and its path is called its trajectory. The motion of falling objects, as covered in Chapter 2.6 Problem-Solving Basics for One-Dimensional Kinematics, is a simple one-dimensional type of projectile motion in which there is no horizontal movement. In this section, we consider two-dimensional projectile motion, such as that of a football or other object for which air resistance is negligible. Of course, to describe motion we must deal with velocity and acceleration, as well as with displacement. We must find their components along the x– and y-axes, too. We will assume all forces except gravity (such as air resistance and friction, for example) are negligible. The components of acceleration are then very simple: (Note that this definition assumes that the upwards direction is defined as the positive direction. If you arrange the coordinate system instead such that the downwards direction is positive, then acceleration due to gravity takes a positive value.) Because gravity is vertical, Both accelerations are constant, so the kinematic equations can be used. Figure 1. The total displacement s of a soccer ball at a point along its path. The vector s has components x and y along the horizontal and vertical axes. Its magnitude is s, and it makes an angle θ with the horizontal. Step 1. Resolve or break the motion into horizontal and vertical components along the x- and y-axes. These axes are perpendicular, so and are used. The magnitude of the components of displacement along these axes are and The magnitudes of the components of the velocity are and where is the magnitude of the velocity and is its direction, as shown in Figure 2. Initial values are denoted with a subscript 0, as usual. Step 3. Solve for the unknowns in the two separate motions—one horizontal and one vertical. Note that the only common variable between the motions is time The problem solving procedures here are the same as for one-dimensional kinematics and are illustrated in the solved examples below. Figure 2. 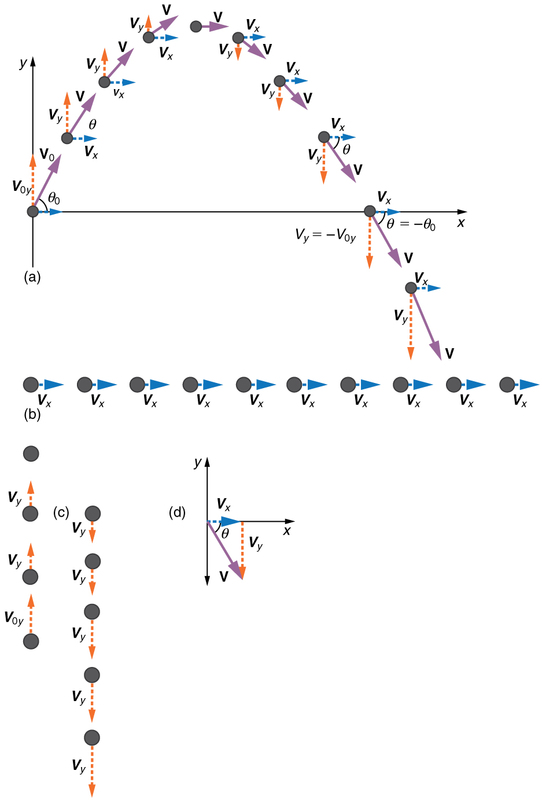 (a) We analyze two-dimensional projectile motion by breaking it into two independent one-dimensional motions along the vertical and horizontal axes. (b) The horizontal motion is simple, because ax=0 and vx is thus constant. (c) The velocity in the vertical direction begins to decrease as the object rises; at its highest point, the vertical velocity is zero. As the object falls towards the Earth again, the vertical velocity increases again in magnitude but points in the opposite direction to the initial vertical velocity. (d) The x – and y -motions are recombined to give the total velocity at any given point on the trajectory. 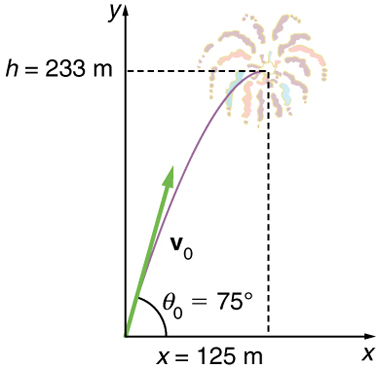 During a fireworks display, a shell is shot into the air with an initial speed of 70.0 m/s at an angle of above the horizontal, as illustrated in Figure 3. The fuse is timed to ignite the shell just as it reaches its highest point above the ground. (a) Calculate the height at which the shell explodes. (b) How much time passed between the launch of the shell and the explosion? (c) What is the horizontal displacement of the shell when it explodes? Because air resistance is negligible for the unexploded shell, the analysis method outlined above can be used. The motion can be broken into horizontal and vertical motions in which and We can then define and to be zero and solve for the desired quantities. Figure 3. The trajectory of a fireworks shell. The fuse is set to explode the shell at the highest point in its trajectory, which is found to be at a height of 233 m and 125 m away horizontally. Note that because up is positive, the initial velocity is positive, as is the maximum height, but the acceleration due to gravity is negative. 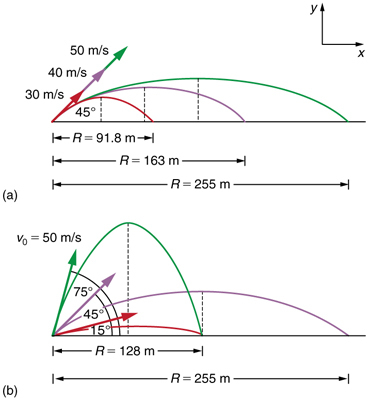 Note also that the maximum height depends only on the vertical component of the initial velocity, so that any projectile with a 67.6 m/s initial vertical component of velocity will reach a maximum height of 233 m (neglecting air resistance). The numbers in this example are reasonable for large fireworks displays, the shells of which do reach such heights before exploding. In practice, air resistance is not completely negligible, and so the initial velocity would have to be somewhat larger than that given to reach the same height. The horizontal motion is a constant velocity in the absence of air resistance. The horizontal displacement found here could be useful in keeping the fireworks fragments from falling on spectators. Once the shell explodes, air resistance has a major effect, and many fragments will land directly below. This equation defines the maximum height of a projectile and depends only on the vertical component of the initial velocity. It is important to set up a coordinate system when analyzing projectile motion. One part of defining the coordinate system is to define an origin for the and positions. Often, it is convenient to choose the initial position of the object as the origin such that and It is also important to define the positive and negative directions in the and directions. Typically, we define the positive vertical direction as upwards, and the positive horizontal direction is usually the direction of the object’s motion. When this is the case, the vertical acceleration, takes a negative value (since it is directed downwards towards the Earth). However, it is occasionally useful to define the coordinates differently. For example, if you are analyzing the motion of a ball thrown downwards from the top of a cliff, it may make sense to define the positive direction downwards since the motion of the ball is solely in the downwards direction. If this is the case, takes a positive value. Kilauea in Hawaii is the world’s most continuously active volcano. Very active volcanoes characteristically eject red-hot rocks and lava rather than smoke and ash. Suppose a large rock is ejected from the volcano with a speed of 25.0 m/s and at an angle above the horizontal, as shown in Figure 4. The rock strikes the side of the volcano at an altitude 20.0 m lower than its starting point. (a) Calculate the time it takes the rock to follow this path. (b) What are the magnitude and direction of the rock’s velocity at impact? Figure 4. The trajectory of a rock ejected from the Kilauea volcano. Again, resolving this two-dimensional motion into two independent one-dimensional motions will allow us to solve for the desired quantities. The time a projectile is in the air is governed by its vertical motion alone. We will solve for first. While the rock is rising and falling vertically, the horizontal motion continues at a constant velocity. This example asks for the final velocity. Thus, the vertical and horizontal results will be recombined to obtain and at the final time determined in the first part of the example. The time for projectile motion is completely determined by the vertical motion. So any projectile that has an initial vertical velocity of 14.3 m/s and lands 20.0 m below its starting altitude will spend 3.96 s in the air. One of the most important things illustrated by projectile motion is that vertical and horizontal motions are independent of each other. Galileo was the first person to fully comprehend this characteristic. He used it to predict the range of a projectile. On level ground, we define range to be the horizontal distance traveled by a projectile. Galileo and many others were interested in the range of projectiles primarily for military purposes—such as aiming cannons. However, investigating the range of projectiles can shed light on other interesting phenomena, such as the orbits of satellites around the Earth. Let us consider projectile range further. Figure 5. Trajectories of projectiles on level ground. (a) The greater the initial speed v0, the greater the range for a given initial angle. (b) The effect of initial angle θ0on the range of a projectile with a given initial speed. Note that the range is the same for 15o and 75o, although the maximum heights of those paths are different. where is the initial speed and is the initial angle relative to the horizontal. The proof of this equation is left as an end-of-chapter problem (hints are given), but it does fit the major features of projectile range as described. When we speak of the range of a projectile on level ground, we assume that is very small compared with the circumference of the Earth. If, however, the range is large, the Earth curves away below the projectile and acceleration of gravity changes direction along the path. The range is larger than predicted by the range equation given above because the projectile has farther to fall than it would on level ground. (See Figure 6.) If the initial speed is great enough, the projectile goes into orbit. This possibility was recognized centuries before it could be accomplished. When an object is in orbit, the Earth curves away from underneath the object at the same rate as it falls. The object thus falls continuously but never hits the surface. These and other aspects of orbital motion, such as the rotation of the Earth, will be covered analytically and in greater depth later in this text. Once again we see that thinking about one topic, such as the range of a projectile, can lead us to others, such as the Earth orbits. In Chapter 3.5 Addition of Velocities, we will examine the addition of velocities, which is another important aspect of two-dimensional kinematics and will also yield insights beyond the immediate topic. Figure 6. Projectile to satellite. In each case shown here, a projectile is launched from a very high tower to avoid air resistance. 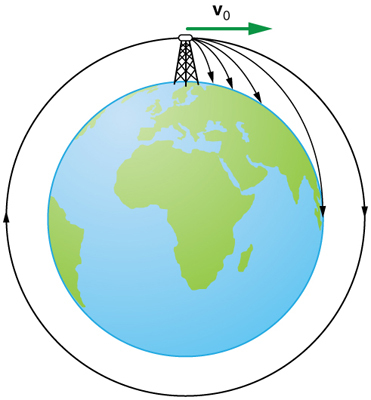 With increasing initial speed, the range increases and becomes longer than it would be on level ground because the Earth curves away underneath its path. With a large enough initial speed, orbit is achieved. Projectile motion is the motion of an object through the air that is subject only to the acceleration of gravity. Determine a coordinate system. Then, resolve the position and/or velocity of the object in the horizontal and vertical components. The components of position are given by the quantities and and the components of the velocity are given by and where is the magnitude of the velocity and is its direction. 2: Answer the following questions for projectile motion on level ground assuming negligible air resistance (the initial angle being neither nor ): (a) Is the acceleration ever zero? (b) Is the acceleration ever in the same direction as a component of velocity? (c) Is the acceleration ever opposite in direction to a component of velocity? 3: For a fixed initial speed, the range of a projectile is determined by the angle at which it is fired. For all but the maximum, there are two angles that give the same range. Considering factors that might affect the ability of an archer to hit a target, such as wind, explain why the smaller angle (closer to the horizontal) is preferable. When would it be necessary for the archer to use the larger angle? Why does the punter in a football game use the higher trajectory? 4: During a lecture demonstration, a professor places two coins on the edge of a table. She then flicks one of the coins horizontally off the table, simultaneously nudging the other over the edge. Describe the subsequent motion of the two coins, in particular discussing whether they hit the floor at the same time. 1: A projectile is launched at ground level with an initial speed of 50.0 m/s at an angle of above the horizontal. It strikes a target above the ground 3.00 seconds later. What are the and distances from where the projectile was launched to where it lands? 2: A ball is kicked with an initial velocity of 16 m/s in the horizontal direction and 12 m/s in the vertical direction. (a) At what speed does the ball hit the ground? (b) For how long does the ball remain in the air? (c)What maximum height is attained by the ball? 3: A ball is thrown horizontally from the top of a 60.0-m building and lands 100.0 m from the base of the building. Ignore air resistance. (a) How long is the ball in the air? (b) What must have been the initial horizontal component of the velocity? (c) What is the vertical component of the velocity just before the ball hits the ground? (d) What is the velocity (including both the horizontal and vertical components) of the ball just before it hits the ground? 5: An archer shoots an arrow at a 75.0 m distant target; the bull’s-eye of the target is at same height as the release height of the arrow. (a) At what angle must the arrow be released to hit the bull’s-eye if its initial speed is 35.0 m/s? In this part of the problem, explicitly show how you follow the steps involved in solving projectile motion problems. (b) There is a large tree halfway between the archer and the target with an overhanging horizontal branch 3.50 m above the release height of the arrow. Will the arrow go over or under the branch? 6: A rugby player passes the ball 7.00 m across the field, where it is caught at the same height as it left his hand. (a) At what angle was the ball thrown if its initial speed was 12.0 m/s, assuming that the smaller of the two possible angles was used? (b) What other angle gives the same range, and why would it not be used? (c) How long did this pass take? 7: Verify the ranges for the projectiles in Figure 5(a) for and the given initial velocities. 8: Verify the ranges shown for the projectiles in Figure 5(b) for an initial velocity of 50 m/s at the given initial angles. 9: The cannon on a battleship can fire a shell a maximum distance of 32.0 km. (a) Calculate the initial velocity of the shell. (b) What maximum height does it reach? (At its highest, the shell is above 60% of the atmosphere—but air resistance is not really negligible as assumed to make this problem easier.) (c) The ocean is not flat, because the Earth is curved. Assume that the radius of the Earth is How many meters lower will its surface be 32.0 km from the ship along a horizontal line parallel to the surface at the ship? Does your answer imply that error introduced by the assumption of a flat Earth in projectile motion is significant here? 10: An arrow is shot from a height of 1.5 m toward a cliff of height It is shot with a velocity of 30 m/s at an angle of above the horizontal. It lands on the top edge of the cliff 4.0 s later. (a) What is the height of the cliff? (b) What is the maximum height reached by the arrow along its trajectory? (c) What is the arrow’s impact speed just before hitting the cliff? 12: The world long jump record is 8.95 m (Mike Powell, USA, 1991). Treated as a projectile, what is the maximum range obtainable by a person if he has a take-off speed of 9.5 m/s? State your assumptions. 13: Serving at a speed of 170 km/h, a tennis player hits the ball at a height of 2.5 m and an angle below the horizontal. The service line is 11.9 m from the net, which is 0.91 m high. What is the angle such that the ball just crosses the net? Will the ball land in the service box, whose out line is 6.40 m from the net? 14: A football quarterback is moving straight backward at a speed of 2.00 m/s when he throws a pass to a player 18.0 m straight downfield. (a) If the ball is thrown at an angle of relative to the ground and is caught at the same height as it is released, what is its initial speed relative to the ground? (b) How long does it take to get to the receiver? (c) What is its maximum height above its point of release? 15: Gun sights are adjusted to aim high to compensate for the effect of gravity, effectively making the gun accurate only for a specific range. (a) If a gun is sighted to hit targets that are at the same height as the gun and 100.0 m away, how low will the bullet hit if aimed directly at a target 150.0 m away? The muzzle velocity of the bullet is 275 m/s. (b) Discuss qualitatively how a larger muzzle velocity would affect this problem and what would be the effect of air resistance. 16: An eagle is flying horizontally at a speed of 3.00 m/s when the fish in her talons wiggles loose and falls into the lake 5.00 m below. Calculate the velocity of the fish relative to the water when it hits the water. 17: An owl is carrying a mouse to the chicks in its nest. Its position at that time is 4.00 m west and 12.0 m above the center of the 30.0 cm diameter nest. The owl is flying east at 3.50 m/s at an angle below the horizontal when it accidentally drops the mouse. Is the owl lucky enough to have the mouse hit the nest? To answer this question, calculate the horizontal position of the mouse when it has fallen 12.0 m.
18: Suppose a soccer player kicks the ball from a distance 30 m toward the goal. 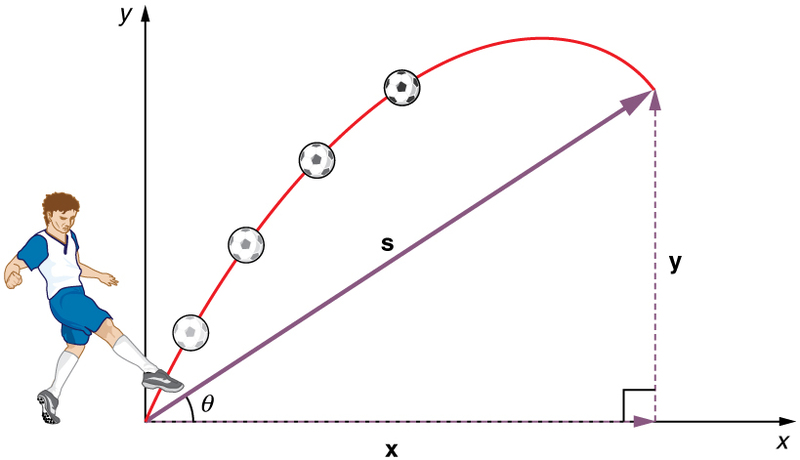 Find the initial speed of the ball if it just passes over the goal, 2.4 m above the ground, given the initial direction to be above the horizontal. 19: Can a goalkeeper at her/ his goal kick a soccer ball into the opponent’s goal without the ball touching the ground? The distance will be about 95 m. A goalkeeper can give the ball a speed of 30 m/s. 20: The free throw line in basketball is 4.57 m (15 ft) from the basket, which is 3.05 m (10 ft) above the floor. A player standing on the free throw line throws the ball with an initial speed of 7.15 m/s, releasing it at a height of 2.44 m (8 ft) above the floor. At what angle above the horizontal must the ball be thrown to exactly hit the basket? Note that most players will use a large initial angle rather than a flat shot because it allows for a larger margin of error. Explicitly show how you follow the steps involved in solving projectile motion problems. 22: A basketball player is running at directly toward the basket when he jumps into the air to dunk the ball. He maintains his horizontal velocity. (a) What vertical velocity does he need to rise 0.750 m above the floor? (b) How far from the basket (measured in the horizontal direction) must he start his jump to reach his maximum height at the same time as he reaches the basket? 23: A football player punts the ball at a angle. Without an effect from the wind, the ball would travel 60.0 m horizontally. (a) What is the initial speed of the ball? (b) When the ball is near its maximum height it experiences a brief gust of wind that reduces its horizontal velocity by 1.50 m/s. What distance does the ball travel horizontally? 24: Prove that the trajectory of a projectile is parabolic, having the form To obtain this expression, solve the equation for and substitute it into the expression for (These equations describe the and positions of a projectile that starts at the origin.) You should obtain an equation of the form where and are constants. 26: Unreasonable Results (a) Find the maximum range of a super cannon that has a muzzle velocity of 4.0 km/s. (b) What is unreasonable about the range you found? (c) Is the premise unreasonable or is the available equation inapplicable? Explain your answer. (d) If such a muzzle velocity could be obtained, discuss the effects of air resistance, thinning air with altitude, and the curvature of the Earth on the range of the super cannon. 27: Construct Your Own Problem Consider a ball tossed over a fence. Construct a problem in which you calculate the ball’s needed initial velocity to just clear the fence. Among the things to determine are; the height of the fence, the distance to the fence from the point of release of the ball, and the height at which the ball is released. You should also consider whether it is possible to choose the initial speed for the ball and just calculate the angle at which it is thrown. Also examine the possibility of multiple solutions given the distances and heights you have chosen. (b) The arrow will go over the branch. (c) 80.0 m. This error is not significant because it is only 1% of the answer in part (b). (b) The larger the muzzle velocity, the smaller the deviation in the vertical direction, because the time of flight would be smaller. Air resistance would have the effect of decreasing the time of flight, therefore increasing the vertical deviation. 4.23 m. No, the owl is not lucky; he misses the nest. No, the maximum range (neglecting air resistance) is about 92 m.
(b) The ball travels a total of 57.4 m with the brief gust of wind. 3.4 Projectile Motion by OpenStax is licensed under a Creative Commons Attribution 4.0 International License, except where otherwise noted.